Remember when Amanda said T-Bone Burnett is her favorite producer? She’s proving it this episode by walking Rich, Will, and John through Raising Sand, the unlikely collaboration between blues-rock god Robert Plant and bluegrass goddess Alison Krauss. These two found the common ground between their respective genres by covering artists from the Everly Brothers to Sam Phillips, and found their own beautiful sound while they were doing it. All of the musicians on this album are incredible, but nobody except T-Bone Burnett could have seen this project through, and that is why we love him. Alison has always been very, very good at covers in surprising genres. One of her earliest albums with Union Station included a cover of “Midnight Rider” by the Allman Brothers Band, and since then she’s covered the Beatles, Todd Rundgren, the Foundations, the Supremes, and many others, and performed on tributes to James Taylor and Paul Simon. Many videos are linked below. Led Zeppelin also did many covers, but did not generally care to credit them as such. Speaking of Zeppelin, we didn’t really talk about them all that much in this episode, on the reasoning that most of our listeners are probably already familiar with them. There’s really nothing new to say about Led Zeppelin at this point, anyway. Speaking of unlikely collaborations, Amanda talked briefly about Rare Bird Alert, the very good bluegrass album that Steve Martin did with the Steep Canyon Rangers. Martin has been a banjo player for ages (and is very good at it - the man is unfairly talented) and that album is excellent. Peter Gabriel famously refused to give titles to his first few solo albums. When the record company got fed up and informed him that albums really need to have titles, he responded, “So?” Which ended up being the title of his next album. Michel Gondry is a French filmmaker who, when not making music videos, is known for his unusual visual style. He was also one of the screenwriters for Eternal Sunshine of the Spotless Mind. We’re not sure whether Sam Phillips was also in charge of selecting the songs that appeared in Gilmore Girls, but whoever it was did a fantastic job. Several of the characters were major music nerds, and the show was full of amazing songs by the likes of Sparks, the Pernice Brothers, XTC, and Sonic Youth. Rich has become obsessed with her music since this episode and particularly recommends that everyone listen to the albums Martinis & Bikinis and Cruel Inventions. While working on this episode, Producer Mike noticed that Robert’s voice on “Polly Come Home” appears to have some pitch correction applied to it. This is very surprising on a T-Bone Burnett production, and it’s worth noting that they didn’t perform that song at either of the concerts Amanda saw on the tour. Prior to this recording, John had never imagined a scenario where he would be the biggest Zeppelin fan in a group of music nerds. Tom Waits also has an acting career. Amanda has never seen any of his movies but is told is he was very good at playing a grumpy prospector in The Ballad of Buster Scruggs. Our episode archive is absolutely dominated by the 1970s. This is Amanda’s feeble attempt to show the other decades some attention. 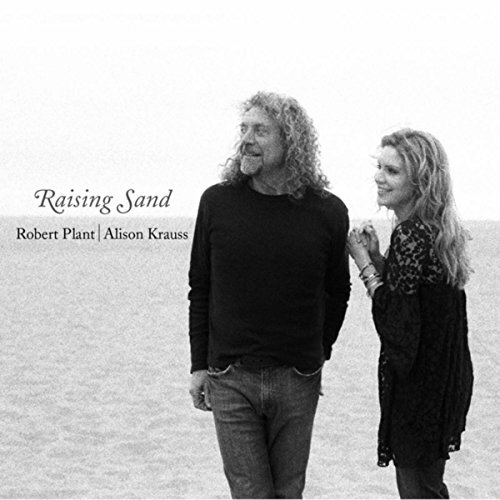 You can buy or stream Raising Sand and other albums by Alison Krauss, Robert Plant, and their various associated bands at the usual suspects such as Spotify, iTunes, YouTube, and Amazon (affiliate link). Follow Discord & Rhyme on Twitter @DiscordPod for news, updates, and other random stuff. Follow Rich @zonetrope, Amanda @MagneticInk67, John @tarkus1980, and Will isn’t on Twitter - he done moved on. Special thanks to Rich for editing and Mike for production. See you next album, and be ever wonderful.